Finding an accessible, private rental property can be tricky for some individuals with disabilities. Not all rentals are accessible to all ability levels, and even some of those that are labelled "accessible" or "with disabled access" do not necessarily include the same features, or the features required to make life easier for those with specific disabilities. To make a rental property search easier, everyone looking for an accessible home must know what they need. Then, depending upon whether they are looking to rent a home or a holiday rental, they can begin their searches in a number of different ways to increase their chances of success. Make a list of the specific features you need in your home before beginning the hunt for a rental property. By itemising such a list it helps everyone involved in the property search, from you to estate agents to family and friends, stay on the same page about the type of property needed and properties which can be eliminated immediately if they do not meet specific requirements. For example, wheelchair users may prefer single-storey homes so two storey homes can be struck off the search list from the start. 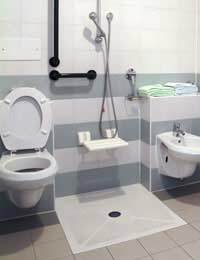 Finding a rental which is be accessible for individuals with disabilities may take some work but Part M of the Building Regulations requires new dwellings to provide reasonable provisions for those with disabilities to approach and access their homes, as well as setting minimum standards for circulation and water closets. A rental property search for newer properties (post 2000 builds, at least) therefore, will probably bring up more attractive properties. Some disability charities or local authorities also keep lists of accessible rental homes in specific areas and you could also, talk with local residents, businesses, schools or clubs which serve people with disabilities in the area. The Disability Discrimination Acts 1995 and 2005 work together to protect the rights of individuals with disabilities when it comes to renting properties and making accessibility adaptations. Disabled Facilities Grants are also available in England, Wales and Northern Ireland to tenants who require adaptations to allow them to continue living in a rented property (given that the adaptations are necessary, reasonable and practical). Landlords may also apply for such grants on behalf of tenants with disabilities. In Scotland, those in need of adaptations at home should contact their local councils to learn more about financial assistance. To prepare for such applications, individuals should be ready to explain their ability limitations, the adaptations required to make it possible for them to continue living at a given location and that they intend to live at the location for the duration of the grant period (for the Disabled Facilities Grant this is a term of five years). Holiday rentals accessible for those with disabilities tend to advertise themselves as such, including the manner in which they are accessible. Some holiday rental websites and services have specific sections for accessible properties, while some sites exist solely to allow those with disabilities to find appropriate holiday accommodations. Speciality travel agencies also cater to holidaymakers with disabilities so that transportation and accommodation can be booked together and all travellers can be confident that all aspects of holiday travel will be accessible. Finding an accessible rental property may not be quite as easy as finding a property without specific accessibility requirements, but it needn't be impossible either. List specific requirements, know where to look for year-round rentals, how to adapt a rental and how to find appropriate holiday accommodations and you'll increase your success rate.